EVE is known for its "learning cliff". The highsec carebear experience is about learning from mistakes. The New Order has taken it upon itself to assist as many carebears as possible in learning from as many mistakes as possible. However, carebears can be slow to learn. Therefore, the highsec carebear experience is also about not learning from mistakes. This paradox represents the essential conflict of the carebear psyche, the Goofus and the Gallant. Rebel carebear Ms Launa famously wasted billions of isk on pointless bounties against the New Order. She didn't learn her lesson from the mockery she received after putting a sizable bounty on my 1-man corp, Experimental Fun Times Corp RELOADED. Instead, she doubled down (again) by placing a 15 billion isk bounty on The Conference Elite. 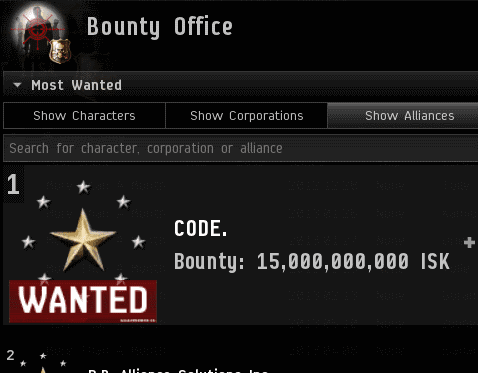 ...after which she placed another 15 billion isk bounty on the CODE. alliance as a whole. 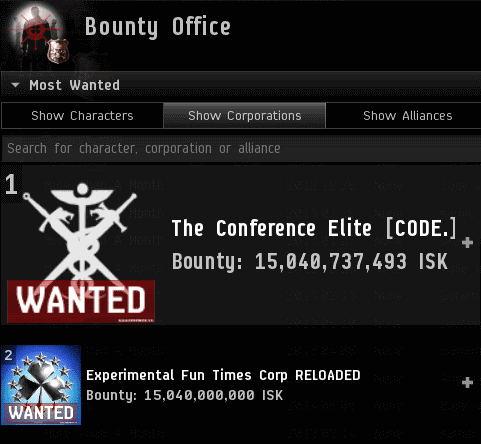 The Conference Elite and CODEdot now stand at the top of the corp and alliance bounty leaderboards for all EVE. When will Ms Launa learn her lesson--before or after she runs out of isk? Now let's talk about learning. The notorious rebel "spy" Ledrian Saisima first came to prominence a year ago after being featured in a MinerBumping series, "Sins of a Solar Spymaster". 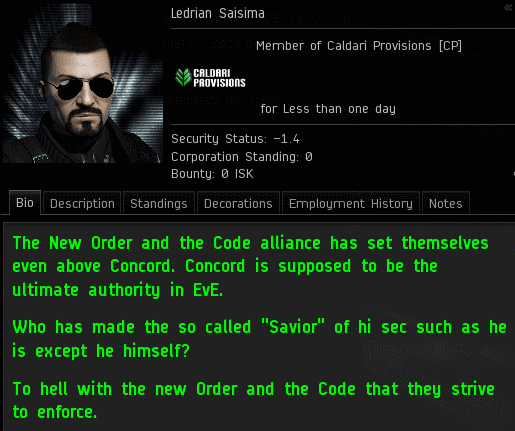 Though Ledrian failed to gather any intel on the New Order, he kept up the spymaster routine for a while before he quit EVE. Then he came back and requested a permit. Was this for real, or just another trick? It was real. 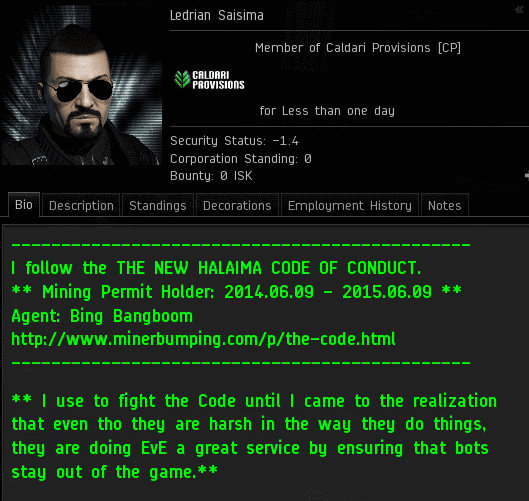 Ledrian sent Agent Bing Bangboom the necessary 10 million isk and vowed to uphold the Code in all things. At last, Ledrian learned it is impossible to defeat the New Order. ...But remember, this is Ledrian Saisima we're talking about. Less than 24 hours later, Ledrian pulled a 180 and declared himself an enemy of the New Order. Carebears of highsec, learning and not learning. Don't be discouraged; some miners just need a little extra help. And some need a lot. That might be the guy that dropped the can I saw that said "I sold my soul to James 315 and all I got was a 800 mill bounty and a loose bum." I didn't realize that James was in the business of collecting souls. If he is I have a few for sale. Gorila vengaza trying to ride the code success train again. This is not the fastest renunciation I've ever had. I had one Russian guy buy two in an hour, all the while denouncing me and the New Order and claiming he would soon stand in the smoking ruins of Washington DC. I had something like that two. A guy who purchased 3 permits while swearing at me at the same time. http://imgur.com/CFNjUDk . This permits where invalid the second they got handed out. Ledrian Saisima made a halfhearted attempt to try to "get right with the CODE" and made his real intentions obvious, to try to get into any CODE. corp and awox it's members. Any claims he makes about having anything to do with CODE. should be disregarded. Would have made a great story; knowing that he wanted to AWOX, baiting him into trying it, pulling a reverse-AWOX on him and then booting him. Sadly I've observed that most 'agents of the new order' seem to be lacking in the "think for themselves" department. This sadly happens when you play with a group of people who can't think for themselves for extended periods of time. But yes, I do agree that a reverse-AWOW would have been pretty cool. "Here I stand a man among cattle and wolves, if only they saw the light and just sort of did nothing in EVE except maybe engaging with the meta a bit on this blog that has jokes I don't get"
Proof of not only bot aspirancy, but actual full-blown botitude. How else does one flip a switch like that, unless one has a switch to begin with? So anyone around here who studied psychology and can make some guesses on what mental illness it is Ledrian has? Schizophrenia? Definitely not schizophrenia. Id be more inclined to think he is afflicted with a personality disorder. His complete disregard for the lawful rules, well-being of others, and repeated dishonest behavior would hint more towards antisocial personality disorder. Unfortunately, disorders of that type are exceptionally difficult to treat.